WIRELESS – slow and targeted at ‘lightweight use’, not video streaming (including Skype) or file downloading. Our monitoring software will report a fault if an access point is disconnected. We may make a £15 service charge if we visit a room to maintain an access point and find that it has been deliberately disconnected from the mains or the network. We are unable to turn off the flashing lights on the Access Point - you can cover the side of the Access Point with a sock, piece of card etc. You must have set up your Single Sign On (University email account access: SSO - see below) to be able to connect to the wired College network. 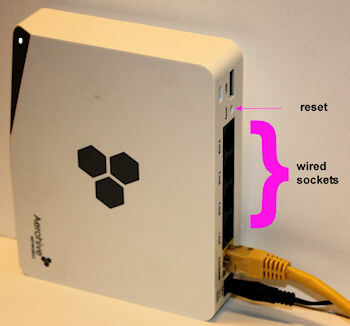 If your room has one of the below pictured access points, connect your computer’s network cable into any of the four wired sockets on the side of the access point (white box with three hexagons on it). Open a web browser and type in ‘bbc.com’ and you will be re-directed to a registration page. Click the link below ‘SSO Balliol College Account Holders’ and follow the on-screen instructions. Your computer needs to have its network address set to ‘Automatic’ or ‘DHCP’ to get the screen above. This is standard for most computers. 1) University-provided network for use with VPN software. Not suitable for mobile devices. Login via SSO + remote access password + VPN client. 2) University-provided network for Academic Visitors (OWL-visitor). Your passwords are distributed by your conference organisers. Login via time-limited credentials. Balliol: In-house wireless system for Balliol members’ computers. You should have received an email with instructions on how to connect. These will be made available on Weblearn shortly. Login via SSO + password. Guest: In-house system for College guests. Login via: time-limited password. The SSO is the University’s Single Sign On username, e.g. ball1234, used for accessing email and remote access. *For eduroam this can be an SSO for the user’s home institution (enabled for eduroam), e.g. ball1234 or abcd1234@kent.ac.uk, and its associated remote access password. This password is set here. It is not the same as your email password but is the same as the VPN password. Setting a new remote access password can take up to an hour to sync through the system. Balliol members are recommended to use eduroam or Balliol. A few legacy Oxford websites still require OWL. Academic Visitors should use eduroam if they are set up for it at their home institution or OWL if this has been set up in advance through their conference organiser. If you have problems, then you can always use the computers in the Holywell and Balliol computer rooms while they are sorted out. Note that whilst we will assist you to connect to the network and will help counter virus infections, other problems with your computer remain your concern.